Don't be fooled by the gifty, attractive look and feel of this little square hardback. 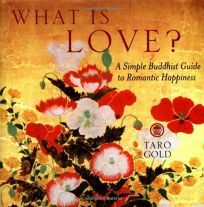 It may appear similar to any number of frothy books on spirituality and relationships, but it rises above the genre to offer some reflective and even profound wisdom about Buddhism and romance. Although the Buddha himself left his family for an itinerant life, and Buddhism stresses non-attachment, Gold says that Buddhism is primarily about ""living a joyful life,"" which includes satisfying romantic relationships. He draws on a variety of Buddhist teachings (particularly from the Nichiren tradition, and its lay movement, Soka Gakkai), sprinkling dharma quotes throughout his own text. The short chapters help readers distinguish between love and illusion, take responsibility for creating their own happiness, overcome fears of pain and loss, and focus on inward change. This is a beautifully illustrated, accessible and perceptive guide.